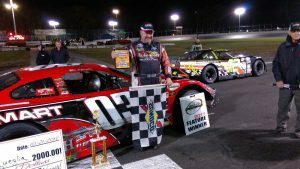 WATERFORD, Conn. – Joe Squeglia used a late pass of Angelo Belsito to capture his third Granite State Pro Stock Series victory of the season on Saturday night at New London-Waterford Speedbowl. In the 25-car field that was filled with talent, Squeglia had to start ninth in the 100-lap main event, but it didn’t take him long to work his way up through the pack. He fought for second spot for most of the first half of the race, but when he finally got clear, he set his sights on Belsito looking for the top spot. He was able to drive around Belsito in lapped traffic with just over 20 laps to go. A caution set the stage for a wild finish, but it was Squeglia who would get the jump and pull away from the rest of the field, capturing his third victory on the season. Squeglia ends the season as the only driver to win multiple feature events on the series in 2017. Although 25 cars took the green flag, it didn’t take long for some of them to be in the pit area with damage. A caution on just lap one saw points contender Scott MacMichael go spinning in turn four, right in front of the entire field. The first 30 laps of the race saw cautions slow the action multiple times. Drivers like Kevin Folan, Nick Lascuola, Bobby Pelland and others all sustained damage during the crashes inside the first 30 laps. However, once the race got going under a green flag stretch, it was Belsito who found himself dominating out in front of the pack. Belsito was cutting through lapped traffic when he approached the No. 48 of Larry Gelinas. In his attempt to put him a lap down, Squeglia came from behind and made a move to slide by Belsito and take over the top spot. When the checkered flag went in the air, Corey Bubar crossed second after getting around Belsito in the final laps. Belsito was third, followed by Ray Christian III and Nick Jenkins. Positions six through 10 went to Derek Ramstrom, Mike O’Sullivan, Ron Silk, Scott MacMichael and Tommy O’Sullivan. With his seventh place finish, Mike O’Sullivan locked up the 2017 Granite State Pro Stock Series championship – which was his second career. He knew he had to just finish the race in front of MacMichael if he wanted to be champion. The Granite State Pro Stock Series will have more on the title run for O’Sullivan in the coming week. For more information, fans are encouraged to visit www.gspss.net, or follow the series on social media.